The L-1011 TriStar's sales were hampered by two years of delays due to developmental and financial problems at Rolls-Royce, the sole manufacturer of the aircraft's engines. Between 1968 and 1984, Lockheed manufactured a total of 250 TriStars, assembled at the Lockheed plant located at the Palmdale Regional Airport in southern California north of Los Angeles. After production ended, Lockheed withdrew from the commercial aircraft business due to its below-target sales. Having experienced difficulties with some of their military programs, Lockheed was eager to re-enter the civilian market with a smaller wide-body jet, and their response was the L-1011 TriStar. 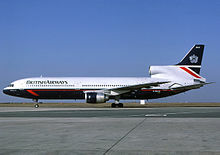 Douglas Aircraft answered American Airlines with the DC-10, which had a similar three engine configuration and dimensions. Despite their similarities, the L-1011 and DC-10's engineering approach differed greatly. McDonnell, who had recently taken over Douglas Aircraft, directed DC-10 development on a "very firm budget, and cost overruns were unacceptable – even at the expense of safety", and the conservative approach meant reusing Douglas DC-8 technology. 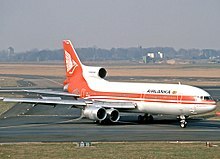 By contrast, Lockheed would "take the most advanced technology of the day and when that technology was lacking, Lockheed created it" for the L-1011 in order to give it lower noise emissions (in the early 1970s, Eastern Air Lines nicknamed the L-1011 "WhisperLiner"), improved reliability, and higher efficiency over first generation jet airliners. The TriStar name was selected in a Lockheed employee naming contest for the airliner. The advanced technology that went into the TriStar resulted in a high purchase price. It has been said that "airlines could get a 747 for slightly more, or a DC-10 for a good deal less". An Air Lanka L-1011-500 TriStar ferrying an extra engine. 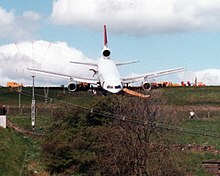 A British Airtours TriStar overran the runway at Leeds Bradford International Airport in 1985. N1011 – L-1011-1 on display at the Delta Flight Museum in Atlanta, Georgia. This is the forward upper fuselage of the prototype aircraft and is painted in Delta colors. C-FTNA - L-1011-1 on display at the Lyon–Saint-Exupéry Airport in Lyon, France. After Air Transat flight TSC906 was damaged in a hailstorm, the plane returned to Lyon and was written off. It is still used today for emergency training. N31019 – L-1011-50 on display at the National Airline History Museum in Kansas City, Missouri at the Charles B. Wheeler Downtown Airport. TT-DWE – L-1011-100 on display at the Emirates National Auto Museum in Abu Dhabi, United Arab Emirates. This aircraft was originally delivered to British Airways. HZ-AHP – L-1011-200 in Saudia livery on display as a gate guardian at the Royal Saudi Air Force Museum in Riyadh, Saudi Arabia. 9Y-TGN – L-1011-500 on display at the Chaguaramas Military History and Aerospace Museum in Chaguaramas, Trinidad. This aircraft was previously operated by BWIA West Indies Airways. N91011 – L-1011-500 was in storage at Southern California Logistics Airport in Victorville, California. Tristar History and Preservation has made it flyable and it now resides at Kansas City International Airport. ^ a b c d "Requiem for a Trijet Masterpiece - the Lockheed L-1011". September 30, 2015. ^ a b c d e "The Lockheed L1011 - Saying Goodbye to Another Trijet". March 24, 2014. ^ SAE Transactions. Society of Automotive Engineers. 1970. p. 1436. Retrieved December 11, 2008. ^ Pugh 2001, pp. 120–122. ^ Kocivar, Ben. "Giant Tri-Jets Are Coming." Popular Science, Volume 197, Issue 6, December 1970, pp. 50–52. ISSN 0161-7370. ^ "TriStar Tankers...The RAF Goes Widebody". Air International, Volume 29, No. 6, December 1985, pp. 271–277. Bromley, UK: Fine Scroll. ^ Craig, Hoyle (March 27, 2008). "UK signs £13 billion tanker deal". FlightGlobal. ^ Job 1994, pp. 99, 101–102. ^ "Prototype Lockheed L-1011". Delta Flight Museum. Retrieved June 9, 2016. ^ "Accident information : Lockheed L-1011 TriStar Air Transat C-FTNA". Aviation Safety Network. Retrieved June 18, 2018. ^ "Google Maps view". Google Maps. Retrieved June 18, 2018. ^ Löffler, Dennis (April 6, 2010). "Photo: TT-DWE (CN: 193N-1093) Lockheed L-1011-385 Tristar by Dennis Löffler Photoid:6854229". JetPhotos.Net. JetPhotos.Net. Retrieved September 20, 2016. ^ "Airframe Dossier - Lockheed L-1011-200 TriStar, c/n 1190, c/r HZ-AHP". Aerial Visuals. AerialVisuals.ca. Retrieved September 20, 2016. ^ "Lockheed L-1011-500 Tristar Original model: L1011-500 9Y-TGN". JetPhotos.Net. JetPhotos.Net. Retrieved September 20, 2016. ^ "TriStar History and Preservation, Inc. to preserve a former TAP Air Portugal Lockheed L-1011 TriStar in TWA colors at Kansas City". World Airline News. January 10, 2015. Retrieved June 9, 2016. ^ Taylor, Jane's All The World's Aircraft 1982–83, pp. 405–406. Frawley, Gerard. The International Directory of Military Aircraft, 2002–2003. Fyshwick, ACT, Australia: Aerospace Publications Pty Ltd., 2002. ISBN 1-875671-55-2. "Lockheed L-1011 TriStar". Forecast International. August 2001.